Islamabad : A Hindu temple was vandalised in Pakistan’s southern Sindh province after miscreants set fire to holy books and idols inside the premises, leading to shock and fear among the community. The arson attack took place in the Sham Sundar Shewa Mandli Temple situated in Kumb, a town in Khairpur district of Sindh province on Sunday evening, Samaa TV reported. 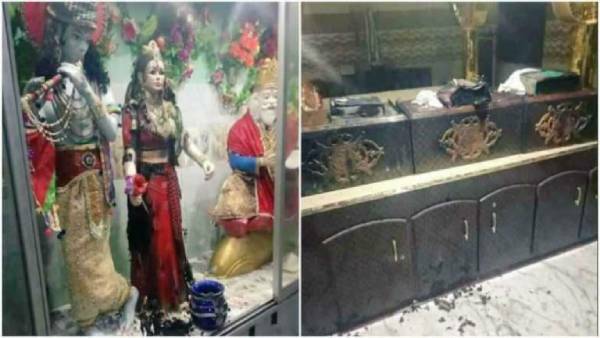 The suspects entered the temple at around 6 pm (local time) and set fire to idols and three sacred books, including Bhagwad Gita and Guru Granth Sahib, which were kept in separate rooms. The fire destroyed the books and the idols. The miscreants fled from the scene. An FIR has been registered against the unidentified persons. According to the TV report, children sounded the alarm about the fire and quoted a resident who said the miscreants vandalised the temple within 15 minutes. The police found fingerprints from the window of temple and have taken three persons into custody, said Vijay Kumar, in-charge of the temple, according to the report. Surprisingly, there is no caretaker at the temple, located in a Hindu populated neighbourhood. The community believed that the place of worship was safe enough and it is situated near their respective houses. Also, the door has not been locked as many people come and visit the temple. Taken aback, the Hindu community said it had not received any threats. Expressing concerns over the security of Hindu temples, Rajesh Kumar Hardasani, the adviser of the Pakistan Hindu Council, has urged for the constitution of a special task force for enhanced protection of other Hindu temples. “This action has caused unrest among the Hindu community. These types of attacks are conducted in an attempt to disturb religious harmony across the country,” he added.